Bladder cancer is any of several types of cancer arising from the tissues of the urinary bladder. It is a disease in which cells grow abnormally and have the potential to spread to other parts of the body. Symptoms include blood in the urine, pain with urination, and low back pain. 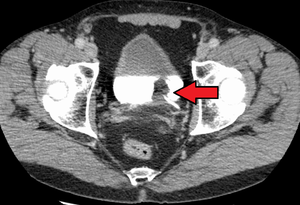 Bladder tumors are staged using the TNM system, which stands for “tumor,” “node,” and “metastasis.” The stage indicates how deeply the tumor has penetrated the bladder wall (T stage), whether it has reached the lymph nodes that drain the bladder (N stage), and whether it has metastasized or spread to other parts of the body (M stage). All of this information is then used to categorize the cancer into a “stage group” between 0 (least advanced) and IV (most advanced); this helps the doctor to decide on a treatment approach.Invasive bladder cancer is stage T1 or greater, which means that the tumor has invaded the lining of the bladder. Risk factors for bladder cancer include smoking, family history, prior radiation therapy, frequent bladder infections, and exposure to certain chemicals. The most common type is transitional cell carcinoma. Other types include squamous cell carcinoma and adenocarcinoma. Diagnosis is typically by cystoscopy with tissue biopsies. Staging of the cancer is typically determined by medical imaging such as CT scan and bone scan. Treatment depends on the stage of the cancer. It may include some combination of surgery, radiation therapy, chemotherapy, or immunotherapy. Surgical options may include transurethral resection, partial or complete removal of the bladder, or urinary diversion. Typical five-year survival rates in the United States are 77%.